Bagman was a different kettle of fish back in 1982. It’s a platform game, but with lots to do besides climbing up and down ladders, although there’s a lot of that, too. It also was an early game to feature multiple screens, and certainly one of the first with multiple contiguous screens. The game was done by Valadon Automation, a French company with a few other titles to its credit, although nothing approaching the same popularity as Bagman. The game was quickly licensed by Stern Electronics that year, who followed it up two years later with Super Bagman, adhering to the same theme but with some refinements in gameplay. As for Stern, you can check out our article on their most famous creation here. The Bagman marquee spells it out. The game places you in the striped pajamas of an escaped convict, returning to the mines where he has hidden his ill-gotten bags of gold. 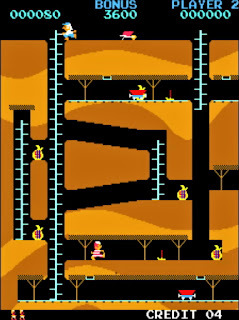 The plot is thin enough that the entire story can be relayed in a comic strip displayed on the game’s front cabinet marquee: Bagman must pick up and take the gold bags to the top of the mine and place them in a wheelbarrow that he can move left and right across the three screens that make up the mine. To facilitate this, he can grab hand-holds above the mine cart track and pull himself up to avoid it, and drop himself down into it as it passes below him. For defense from the guards who are chasing him through the passages, he can either drop sacks down on top of them from ladders, or use a trusty pick-axe he can find in the maze. If he can collect all the bags lying around, he’s scott-free… at least until the whole thing starts again at a harder difficulty. While the game is fun, it is also extremely difficult. There are only a few paths to take to get away from the ever-patrolling guards, and there are plenty of ways Bagman can end up dead on his back; falling down a shaft, getting flattened by the mine cart, or perhaps just plain running out of time. 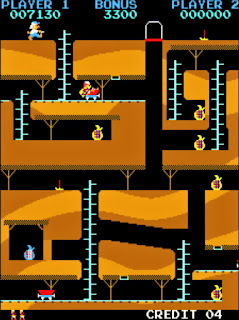 The bonus clock will reset every time the player puts a bag of gold in the wheelbarrow, but getting to the bottom of the mine and back up, while avoiding all the traps and the guards, before becomes a daunting task. In this game, you don’t only lose your bonus when it ticks down to zero, you also lose a life. Knocking the guards out only incapacitates them for a very brief few seconds, so rushing to put some distance between you and them before they awake makes for some thrilling moments in the game. A nice touch is that you can drop a sack of gold on an incline, and it will slide for a distance, knocking any guard who it touched out cold. There is also a buried blue bag of gold the player can go for, although he has to use a pick-axe to dig his way through. This bag will award him more points if he plants it in the wheelbarrow, but it is also heavier than the others and slows Bagman down to a crawl. 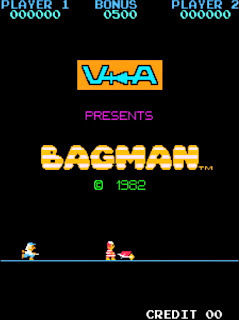 The graphics are serviceable and clever, but what might linger most in people’s minds is the sound in Bagman. Aside from the strains of Turkey in the Straw that repeat over and over again, burning into your brain as you play, the main character is also given a voice, of a sort. His comments are produced by a Texas Instruments TMS5110A, a version of the TI LPC speech synthesizer chip that also appeared in TI’s ubiquitous Speak and Spell educational toy line. They also seem purposefully nonsensical, such as the “Ohwaa” Bagman exclaims as he places a money bag in the wheelbarrow, or his breathless “Ohhhhwe!” as he hoists himself up via rafter. Not to forget the defeated “Ay yi yi” he utters when he’s caught or otherwise dispatched. This really serves to bring the protagonist to life. Or death, as it were. Bagman is a solid package, with a lot of charming quirks and being a lot more involved than most platformers of the day. The real issue affecting its popularity is that it was inexplicably never ported to a home console. It deserves to be hauled out of the mines of obscurity to bask in the bright light of gaming nostalgia. This entry was posted in 1982, arcade on March 2, 2011 by William Hunter.